Nonprofit fundraising, at its core, is storytelling. Telling a story of how your organization has helped one beneficiary be transformed is the building block of telling the story of your organization. In nonprofit development, the story we use in fundraising is called the story of the one. It’s called the story of the one because you’re telling the story of how one beneficiary’s life was like before the nonprofit helped, during the transformation, and after the organization helped. It’s a story that emotionally connects the reader to the cause. Giving isn’t a logical decision, it’s an emotional one. You need to emotionally connect with someone to overcome their attachment to their hard earned dollars and show them that your organization can be the tool that connects their desire to support a cause with the ability to do good work. You’re the hands and feet to their desire to give back. Children across America and around the world are hungry and waiting for your help. Your gift will supply them with food and essentials. Hunger is a daily reality for boys and girls across America. You can make a difference for children in need with your gift today. Even if only one child goes to bed hungry tonight America, thats one too many. No child should have to live in fear, wondering where their next meal will come from. Will you help me put a big smile on the face of a hungry and hurting little boy like 6 year old Tony? It’s hard to believe here in America, especially this time of year, but just a few weeks ago, Tony was going to bed hungry nearly every night. His family simply didn’t make enough to consistently serve a healthy dinner. Instead, Tony would only get nourishment in his school lunch. But then friends like you stepped in and provided meals for Tony and his family. You turned around Tony’s holiday season so now he doesn’t have to worry about where his next meal will come from. His parents don’t need to decide between paying for heat or buying groceries. You can put food and other essentials into the hands of children like Tony. The appeal continues on to the call to action. Do you see how, though both appeals focused on hunger, the second appeal connected you to the cause? It helped you see the face of hunger in Tony and put yourself into the shoes of the donor that helped Tony and his family. The first appeal is still common with many nonprofits – using statistics instead of stories. When you put a face onto the problem you’re solving, you allow the reader to feel the transformation and believe she can make an impact on a real life. We have a long tradition of storytelling. For many people, telling stories is the ideal way for them to learn. Telling a story helps someone connect with a storyteller in a unique way. Several studies have shown that the brain stimulation that occurs during storytelling has a unique way of syncing to the same areas of the brain firing between a storyteller and someone hearing the story. In other words, the reader or listener can feel and think the same as the storyteller. If you tell a compassionate story that moves someone to get involved, you can actually like the thoughts of the storyteller to the story listener. This is a powerful way to move someone to become involved with your nonprofit. Every appeal you send out should have a story. If your nonprofit supports abandoned puppies, you should tell the story of Jack the Terrier who was abandoned, rescued, treated, and placed in a good home. If you work with homeless veterans, tell the story of Bill, the vet who found shelter, food, job training, and now has his own place and a steady job. No matter your cause, a story will connect someone who has a passion for the cause with your organization to support those beneficiaries. Without a story, a fundraising appeal lacks the punch to move the reader to donate. Sure, you may raise a little money with statistics, but a story that connects the reader to real live person moves people to give. Now that we’ve decided we’re going to be a storytelling organization, we need a process to collect and retain your stories. I recommend creating a defined process for story collection so you can have consistent results. Otherwise, different storytellers may ask for different things that may result in incomplete stories or extra work on your part. Defining the story gathering process is an important part of storytelling. Background of beneficiary and the community. What struggles or barriers existed? How did the organization help this beneficiary improve their situation? Please include at least one quote of word-for-word by the beneficiary about their experience before or after receiving help. In many countries, there is a legal requirement to have permission before using a photo or story of a beneficiary. Make sure you have all of the legal releases necessary for the beneficiary to sign and that they fully understand the rights they will be releasing for the story. Once you have a number of stories, you should create a story archive to retain them for future use. This can be as simple as an online archive of Google Docs or as complex as a media server. There are a number of relatively inexpensive media server solutions available as online hosted solutions allowing you to store photos, stories, and videos in one searchable and taggable location. I highly recommend you explore this option; as your media library grows, you’ll want the ease of use to find stories in the future. What Stories Should We Use? Now that you’ve begun collecting stories for use in your nonprofit communications, you need to determine which stories to use. Each type of nonprofit communication piece will have different story requirements. For an annual report or thank you communication, you will probably choose stories that show impact of your work. For a fundraising piece, you’ll want an emotion-driving story that connects the donor to the specific fundraising campaign. Whatever your use, you’ll need to decide which story to use for your purpose. Your audience has a specific desire for types of stories that align with their desire to give to a particular cause. Each communication piece you design will have a specific audience you’d like to reach so the first step in deciding which story to use is to determine who the audience is for this communication piece and what is the best story to accomplish your goal. For example, if you have an email going out to drive advocacy, you’ll probably want a story that demonstrates advocacy in action with people who support your organization. If you have a direct mail letter being sent for fundraising, you’ll pick an emotional story designed to increase fundraising response. Your audience and your goal for that communication piece with that audience will be the first factor to decide which story to select. The more personal and specific a story is, the more it will connect with a reader. This is particularly true for stories that show transformation in the beneficiary’s life. When you’re reviewing potential story options, select stories that have a strong transformation story. When a potential donor is reviewing an appeal, he is often looking at the story of transformation to feel good about his donation going to your organization. If you have a strong story, he will feel like your organization will invest his donation wisely. I recommend having a distribution list of people within your organization that act as story gatherers for you. When you need stories, send out communications to the people who have the best opportunity to gather a story that meets your needs. Ask them to send back a 3-4 sentence summary of potential stories that meet your needs. Review the potential stories for the ones that stick out as the best match for the communications piece you’re writing. Your list should be 10-15 story opportunities. This gives you a large enough list to pick from to find 3-5 good stories. Now that you have a list of 10-15 potentials, prioritize your list and decide which story you believe would be best first. When you’re gathering stories, you’re going to want to gather more than one or two stories. You may find that the stories you gather aren’t as good as you expected, or just won’t fit the final use, so having 3-5 stories on hand is important. Go out to your story gatherer with your worksheet and ask them to get the story for you. Video can convey emotion and impact that words cannot. Creating a short video of the story will help people connect to the beneficiary’s story in ways that you can’t with written word alone. There is a wide range of potential with video from a field staff member grabbing a short video using a cell phone to a fully-produced video. Both have their places and uses. If you need to start somewhere, grab a few stories using cell phones. Here’s an example video I shot using an iPhone X in the Dominican Republic, edited on my Mac, added a voiceover I had done on Fiverr, to create a good video about a revolutionary way we’re helping feed chickens. As you can see, it’s not professionally produced, but it looks pretty good for shot on an iPhone. Using video will help people know, like, and trust your organization. Once you’ve narrowed down the story options, you’ll want to interview several people to land on the story you will want to use. You may find that once you start interviewing for a story, it isn’t as it seemed. Perhaps the context was misunderstood or the beneficiary is having a difficult time communicating. Perhaps what you thought originally was a good story to demonstrate a particular fundraising campaign just won’t work as it is. Whatever the reason, you’ll want several story options available for an appeal. You should always interview for multiple different stories so you have options for your appeals and other nonprofit communications. You may also have other uses for stories in your campaign, such as in social media or in thank you communications for donors. 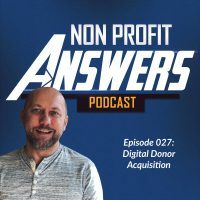 Having multiple stories allows you to tell different stories to connect with donors in different ways. The Relatable Central Character: The beneficiary is the central character in the story. He faces a challenge that he cannot overcome on his own, so he needs help in the form of the hero (the donor) and the organization. The relatable central character needs a story arc of going through a transformation and overcoming something. This transformation cannot occur without help from the donor and nonprofit organization. The story should be about a real person. If you can’t use real names for privacy purposes, use a pseudonym, just make sure you use a name to connect the reader to the central character. The Hero: The donor is the hero of the story. This point is often difficult to overcome for folks inside a nonprofit as they want to see the nonprofit or their own staff as the hero. But in the end, in order for an appeal to work right, your organization is not the hero, the donor is. You see, without the donor, the transformation can never happen. The reader needs to put themselves in the shoes of the donor who can help the central character. Emotional Impact: How do you want the reader to feel? Angry about the problem? Empathy for the central character? A desire for justice? As you write your story, keep in mind the emotional impact you want the story to have on the reader. The power in the story is getting the reader to feel the emotions in the story. So how do we do that? Tell a story with as much vivid detail as possible so the reader can place themselves into the story. The Problem: What is the problem the central character is experiencing that the donor and nonprofit are solving? Describe in detail what the beneficiary’s life was like before you got involved, during, and after. Be as descriptive as possible. The Solution: What did your organization do to help the central character? How was the donor involved? What is life like now for the beneficiary? Call to Action: Now that you’ve established how the beneficiary was helped, you need to call the reader to action. Connect the reader to what his donation will do. Ask for the donation. Storytelling is a powerful way to move the reader to become a donor. Using the Story of the One, your nonprofit will discover that the emotional connect stories create is a foundation to your marketing and fundraising.